My heavenly Mother, Mary, in union with Thee I am about to go along the Sorrowful Way where Thou hast walked so many times. 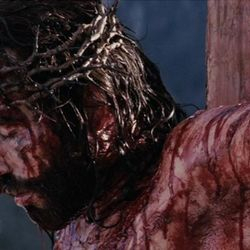 Is it possible that my heart should not be en-kindled when I think of the tears which Thou hast shed on remembering the sufferings of Jesus and when I realize the ardent love that inflamed Thy Heart for God and for all Thy children. O Mother of Love, I give myself to Thee that I may share the sentiments of Thy Heart. Weeping, Close to Jesus to the last. 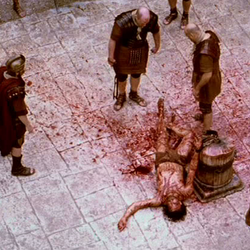 "I have a baptism (of blood) wherewith I am to be baptized; and how I am straitened until it is accomplished". 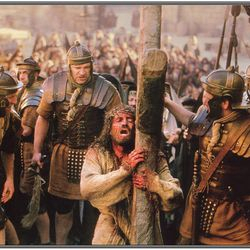 These words of Jesus show the intensity of the love with which He takes up and carries His Cross. They also express the measure of Mary's love. Her Heart, drawn by its love for Jesus, faithfully follows Him in His ardent desires and consents to His sacrifice. 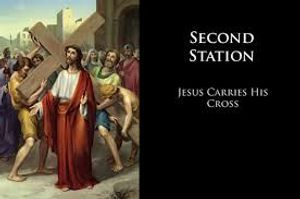 Do I not know that this worthy Mother, always conforming herself to the divine will, would have nailed Her own Son to His Cross with her own hands, had it been necessary for the salvation of my soul?What shall I render to the Queen of my Heart, and to Thee, O my Jesus, for that excess of love! Thou hast given me to understand that in order to please Thee, I must conquer myself. I must renounce myself every day of my life. I must patiently bear with the shortcomings of my neighbour. I must practice the Christian virtues and fight the good fight. O Mary, I consecrate myself to Thee at this moment as fervently as if I did it for the first time in my life, or the last; give me Thy love, give to all Thy children such true love as will enable them to shun no sacrifice in serving and pleasing Thee.Our Father, Hail Mary, Glory be. 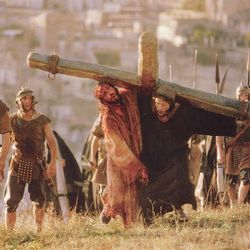 How heavily the Cross weighs upon our meek Saviour, now that He is weakened by so many sufferings. He totters under the blows and the rough treatment which are mercilessly dealt out to Him. And now He falls prostrate to the ground. The thorns of His crown enter deeper into His head. 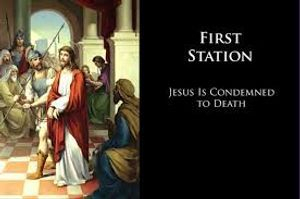 But why this first fall, which causes so much pain to the Heart of Mary? It is to atone for our sins of pride, which have made us the slaves of Satan. 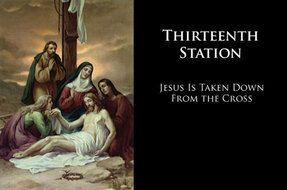 Make amends to the Mother of Sorrows and beg Her to obtain pardon for you. 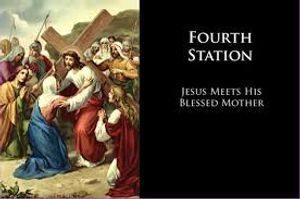 My heavenly Mother, had I but the hearts of all the saints wherewith to console Thee for all the anguish which Thou hast felt for my salvation! To supply the deficiency of my cold heart, I offer Thee the tender compassion which Jesus had on Thee in this sad meeting, and I beg Thee to present to Him on my behalf Thy acts of reparation and of love. Remember, dear Mother, that I also am Thy child. Come then to meet me and to strengthen me on the difficult and dangerous road of this life. Be always near me by that habitual presence with which Thou favours' Thy devoted ones. 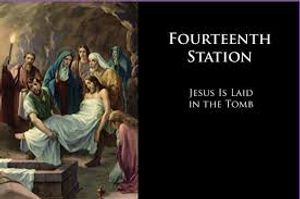 Visit also at this moment, the Holy Souls in Purgatory, especially those that are forgotten; and when my soul departs from this world, come to meet me and present me to Jesus. 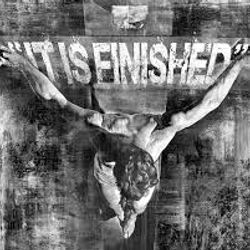 Jesus has borne the weight of your sins, He has paid all your debts. 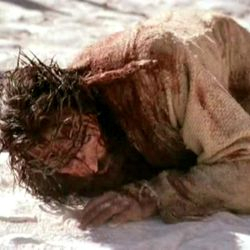 Yet He has left you a share in this work of redeeming your soul, as well as in His sufferings. 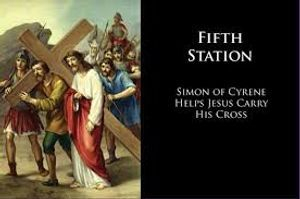 That is what he gives you to understand by calling the Cyrenean to help Him carry the Cross. Child of the Queen of Martyrs, be convinced of this truth, that wherever you go, you will find trials and afflictions. Now is the time for you to suffer, and that is your only way to reach Heaven. But see how good your Saviour is! He has given you His Mother, and to you who have consecrated yourself to Her, She is more particularly a Mother who will be your stay and your consolation in this vale of tears. 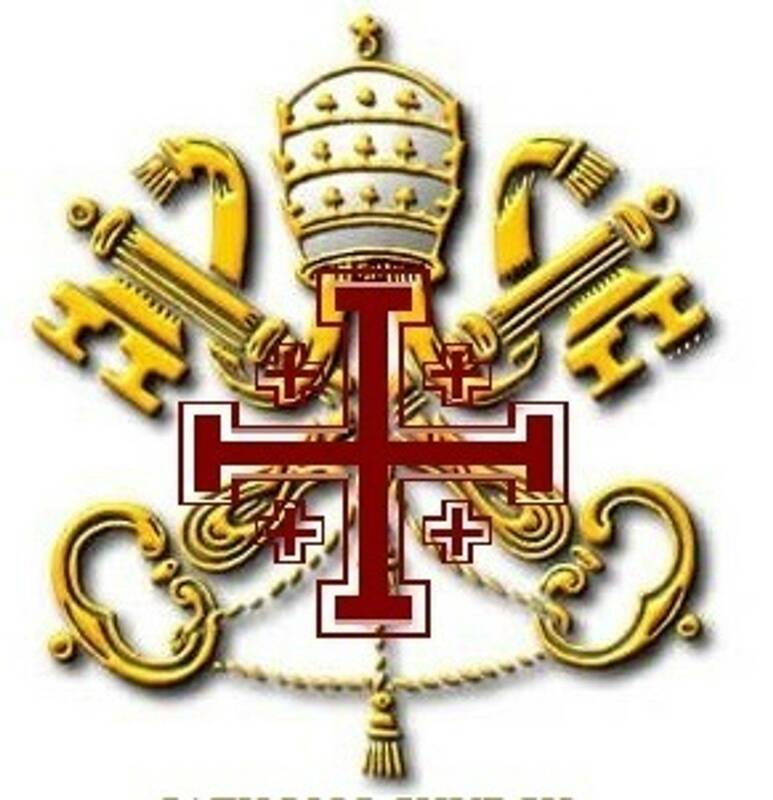 Who, indeed, carries his Cross most easily and with most merit, if not the faithful servant of this sweet Mother?O heavenly Comforter of the children of God, be always my tender and merciful Cyrenean. 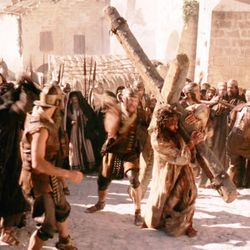 Thou know-est my weakness; be my help in carrying my Cross and my support in the cares and trials of this life. Thou, whose love extends to all creatures, be the help also of those who have charge of others - priests, magistrates, superiors and teachers, and pour out on them in abundance, the spirit of zeal and devotedness in the discharge of their duties. 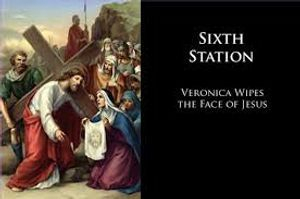 A holy woman makes her way through the crowd and wipes the sacred Face of our Redeemer. O love of Jesus, generous beyond all measure! He does not wait till the day of final recompense, but even in the midst of His sufferings and humiliations, He rewards the valour of this pious woman. What a consolation for Mary to witness this act of charity rendered to Her Divine Son! Do you wish to give Her the same joy? You will do so, if you guard jealously the purity of your soul in which Jesus dwells by His grace. 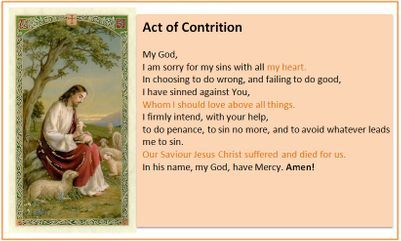 If you should unfortunately commit sin, lose no time in wiping away that stain from your soul by a sincere act of contrition, while you wait for the opportunity to receive the Sacrament of Penance. 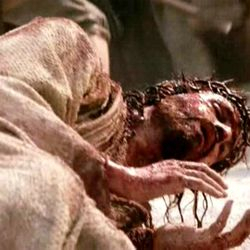 But what grief you will cause your Blessed Mother if, through Luke warmness and affection for sin, you allow your soul to remain more sullied than was the Face of Jesus during His Passion. 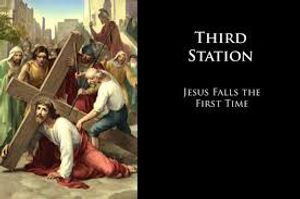 The second fall of Jesus is far more painful than the first. The sight of the many sins which I have committed even in my early youth and of my numberless infidelities bears Him down and causes Him to fall again. 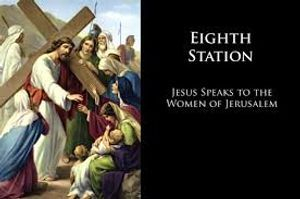 Mary discerns this mystery more clearly than any other human creature and therefore She feels more keenly the torments which rend the Heart of Jesus. Why is my heart not broken by these sad thoughts? 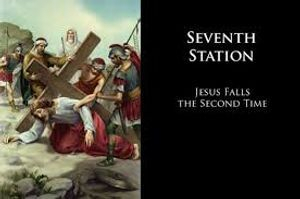 By this second fall, Jesus expiates more particularly the dis-ordinate love of ourselves and of the seductions of this world, which are the cause of so many sins and of the eternal ruin of numberless souls. O Mary, I beseech Thee, by the tears and the sorrows of Jesus, to cure me of my dis-ordinate love of creatures and to wean me from all the things which one day I must necessarily leave behind. O wise and faithful Virgin, teach me to appraise the maxims of the world at their true value. O tender Mother, obtain for all the privileged children of Thy love, that the remembrance of Thy sorrows may detach their hearts from this world and themselves, and cause them to cling more affectionately to Thy holy and Immaculate Heart. 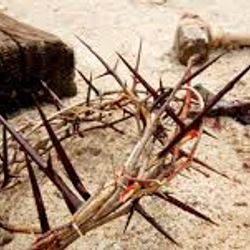 Jesus falls three times on the way to Calvary to expiate the great evils with which sin has wounded the human heart. In His last fall, our meek Saviour atones for our love of pleasure. Consider the abyss of reproaches and sorrows in which He lies, as the executioners renew their blows and their insults, as they tread on this innocent Lamb and drag Him along.O my heavenly Mother, whose Heart was rent again and again, when after the Ascension Thou didst stand motionless and overwhelmed with sorrow at this station, help me to atone for the many sensualities of which I have rendered myself guilty. "If you would keep chaste" says a Saint, "you must obtain this grace by prayer and by an ardent love for Our Lady, the Queen and Model of Virgins".O Virgin most chaste, who didst remain spotless as a lily among thorns, make me pure. Obtain for us who are dedicated to Thee, a special love for this angelic virtue of purity, a holy love which will make us dread whatever may tarnish it in the least. Obtain for us that severe modesty which is the mark of Thy true children. Alas, we have allowed the devil to strip us of the robe of our innocence, and Jesus wishes to restore it to us at any cost. 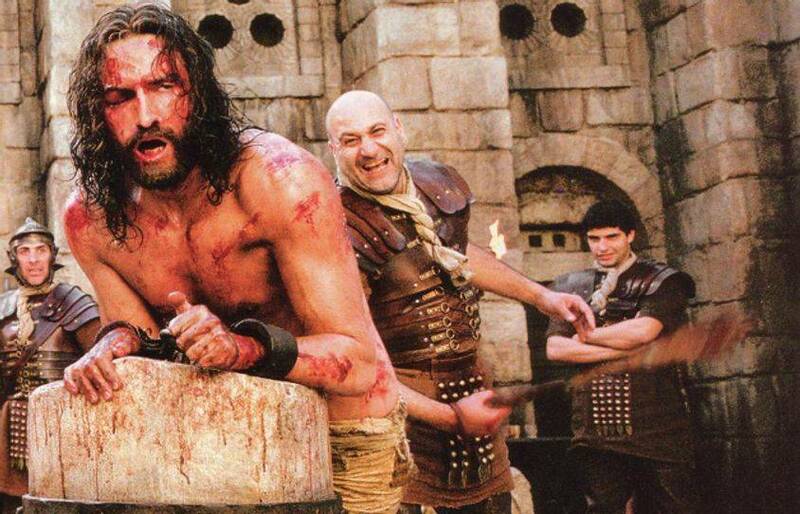 Behold your Redeemer in the dreadful torments which He now endures. 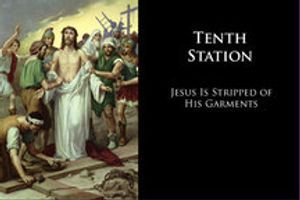 They roughly tear off His garments, which have become encrusted in the wounds of His body; thus the sores are opened afresh and pieces of torn flesh adhere to the garments or our gentle Saviour. 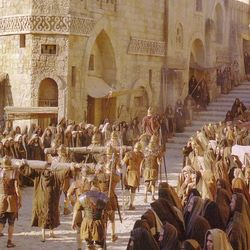 Ask yourself to what extent this inhuman treatment must have renewed the woes of Mary's Immaculate Heart. 'Behold' this Mother of Sorrows seems to say to you, 'what Jesus has paid in atonement for your exaggerated love of fashions and luxuries, for your vanity and immodesty in dress'. O Mother, I beg Thy pardon for having so often made Thee sad by my vanity. Make me love that exterior modesty and simplicity which are so pleasing to Thee. Help us who are the children of Thy love to strip ourselves of our self-love, our self-will, our conceit, which destroy thy work in us and deprive our soul of its merits for Heaven. 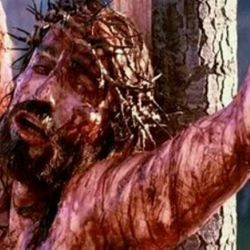 By Thy tears and by the wounds of Jesus, clothe us with the double garments of Thy virtues and riches, which thou reservist for thy true servants, that we may appear with confidence before the Judgement Seat of Thy Son. "O Virgin, Daughter of Sion, great as the sea is Thy sorrow and bitter as it billows". Would that I could compensate Thee worthily and render due homage to thine exceeding love for me! To supply my insufficiency. I offer Thee the divine Compassion which Jesus had on Thee. 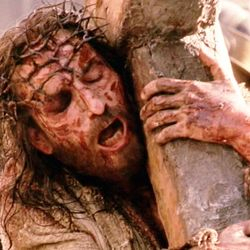 He alone knows the weight and measure of Thy sorrows.O Jesus, hanging on the Cross, speak to me Thy life-giving words - "Woman, behold Thy child; child, behold Thy Mother". O Mary, I do not deserve to be called Thy child, but Jesus has willed that it should be so. Show Thyself my Mother. To compensate for my poverty, I offer Thee the praises of the angels and of all Thy devoted children. I offer Thee the Heart of Jesus and the Love of the Blessed Trinity. I place myself in Thy hands and leave to Thee the full right to dispose of me and of all that is mine, according to Thy good pleasure and that of Thy Divine Son. "O sweet Virgin, my Mother, I implore Thee to engrave the Wounds of my Saviour upon my heart. 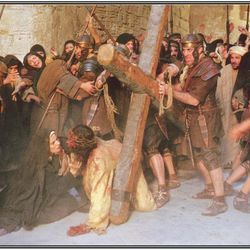 Thy soul was another Calvary, which reflected all the sufferings of Jesus. May our souls be true copies of Thine. Forget not all that Thou hast suffered for our sake. 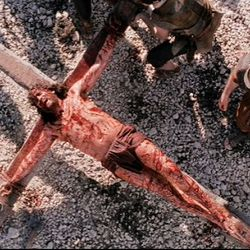 May we, after Thine example, be mindful until death of the Sorrowful events of Calvary, and may their remembrance ever sustain us in our sufferings. Amen."